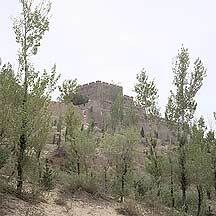 About 7km to the north of 榆林市Yulin city in northern 陕西省Shaanxi province is the largest watch tower of the entire Great Wall - 镇北台Zhenbeitai Tower. 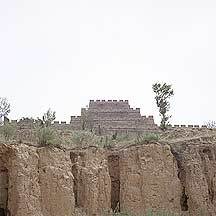 It is a four-tiered, almost perfect square brick and stone structure that tapers as it rises 30 meters from atop the dusty yellow earth of the bald 红山Hongshan mountain, where it has been perching like a dinosaur nest for the past 400 years. 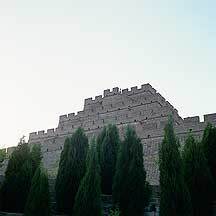 Its dimensions are as follows: Its height is 28.5 meters and its base length - north side is 82 meters, south side is 76 meters and both east and west are each 64 meters. 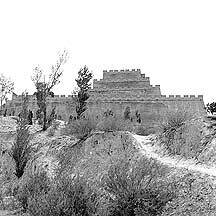 The west side is still linked with parts of the Great Wall made of rammed earth; the east side wall is not attached. I believe it ended in a steep slope. 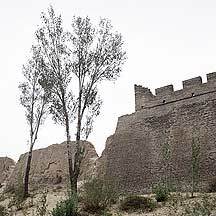 Some remaining wall and reconstructed towers are still visible in the distance on lower grounds. 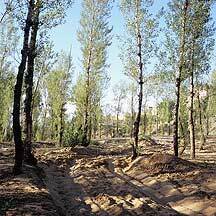 A total of about 700 kilometers of this rammed earth was piled up. 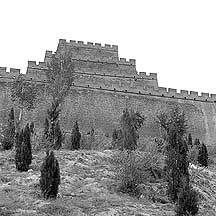 But Yulin is no stranger to walls. Back during the 战国时代Warring States (475 - 221), the 秦朝Qin Dynasty (221BCE - 206BCE), the 隋朝Sui Dynasty (581-617) and finally the 明朝Ming Dynasty (1368-1644), walls were raised in this area. 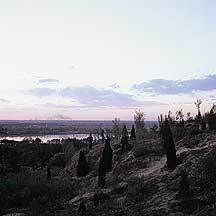 Enjoy the wide 希拉穆仁草原Xilamuren grassland, the huge dunes of 响沙湾Xiangshawan, and the ancient Wall of the 秦Qin state in 内蒙古Neimenggu (Inner Mongolia). The stone lions, chimeras, toistoises and unicorns that guarded the royal tombs of the 六朝Six Dynasties Era for the past 1600 years. 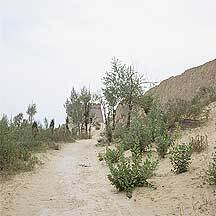 嘉峪关Jiayuguan (Jiayu Pass) - the lone fort at the edges of the desolate and bare Gobi desert. It is at once both a timeless symbol of human's uncompromising reach and an otherworldly mirage. 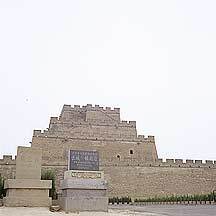 On my way to 榆林Yulin from 包头Baotou (2006), I saw this tower in the distant through the bus window. 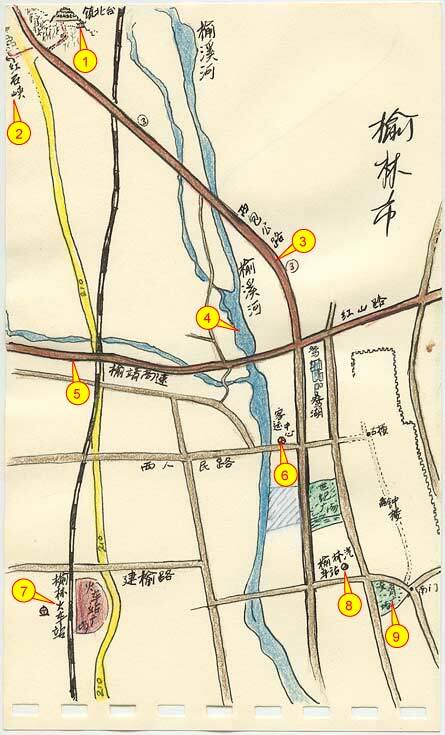 Later, from the local map, I read about this tower and the nearby 红石峡Hongshixia (Red Stone Gorge). So I decided to go. It was only about 25 minutes on public bus from where I stay. I asked to be stopped on its entrance; from there I moved around on its very sandy slopes for about half an hour. Unbelieveably, there was a farm house there with goats walled inside. Besided the living, there were the numerous graves scattered in the area. In the air were filled with tiny flying insects that was impossible to avoid a mouthful. After enough of the flies and sand in my shoes, I went up the concrete road toward the tower. First I came to the ticket office where I bought the ticket; don't bypass this place and skip the ticket otherwise the the staffs far up on the Tower's entrance will have you run back down to get it. With the ticket in hand, I jingled along up the road and make a left; along this road were many more graves - ah! the sorrow of being born and bury here. Up in front of the tower is an empty parking lot taking up almost the entire side of the wall. The area was dead quiet because there is not single being here at June. I met the staffs there after I checked out surrounding area. 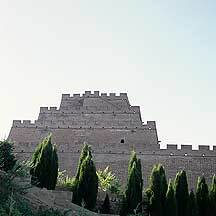 There was construction of other assets for the tower; one of which was a large rectangular building on the slope that will eventually be accessed by a staircase. I asked one of them what was that. The man pulled me over and point at the details, " this is going to be our bathroom, enough to relief fifty tourists all at once. In the middle will be the main reception area and the sides are for toilets. We are prepared for the all the tourists. We will have shopping areas too, soon." I nodded, toilets would be a nice addition. 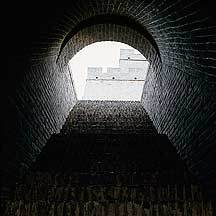 The main gate is on the south side, which I entered and ascended a large tunnel of steps. 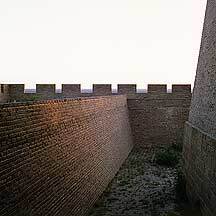 Once out and onto its interior, I was surrounded by its parapets that looks like menacing teeth against the fiery sky; anyone would feel transported back in time. 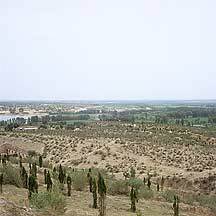 The interior of the first level is wide, consisting of a lower ground level and an upper level runway along the parapets that can be reached by a long filed ram; the lower ground level is dead flat, a single lone elm tree found itself stuck in its northeast corner. The air was thick and I felt some slight sand rolling on my face and the wind whipping and howling, or perhaps I heard the battle cries of the long dead - and also maybe the murmur by recent ones in silent desperation. I circled its borders and looked through the slots. And repeated the same action all the way to the top. 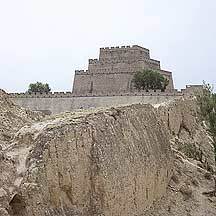 Everything gets narrower up each level til finally it is just a flat roof with a perimeter of about 35 meters. On the center of this flat top level was once a square shed of wood and brick for signalling. Its raised square platform is still there. The top offers a sublime view of everything within a thousand li, so the saying goes. 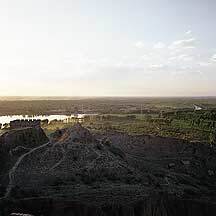 In the far distance is that luckless old river 黄河Huanghe (Yellow River), whose great bend wraps around this entire ordos region; nearest to the tower is its eastern bend, so on a good clear day it is possible to indentify it. Yulin city is on the southeast and is easily visible. To the west about 2 kilometers away is 红石峡Hongshixia (Red Stone Gorge). 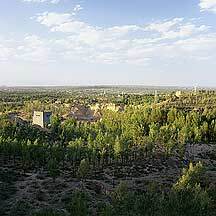 In the northwest is the 毛乌素沙地Maowusu desert basin. But these are not the immediate sights or thoughts. 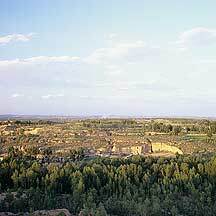 On and on are undulating fields of sandy yellow earth with isolated pockets of greenery dotting its sparse landscape. Nothing rises up but smoke stacks and electric poles. All seems impossible for long stay. Four hundred years ago, this area must be more lushfull. Sand would probably had been less abundant. In those days, this tower watched over a large busy trading market used by both the Hans and the Mongolians; Horses, and livestocks in general, grain and cloths were likely the most traded. I had been circling the walls for a few hours and by now the setting sun had dramatically changed the hue of the landscape, and its last fingers of golden light touched the old discolored bricks that are crowded by young gray ones. As I watched the sun sinks and finally drowned by the sand, I realized that I have to catch a bus back to town. I packed my equipments and headed down. But soon I was stopped by the mighty wood doors of the entrance gate - it was locked. It isn't the first time that I am locked in, and everytime I was able to get out, but how am I going to climb out of this. I peeped through a gap and saw some people walking away in a distance. Of course I knocked and yelled. A minute later a woman openned the gate and was surprised to see me, "you are still here? we are just about leaving." And if I was an extra minute late I would have been a caged bird, alone guarding this tower and admiring the stars. The woman told me that I still have some time for the last bus, so I decided to circle its base. Having observed on its peak, I was obsess with the surrounding landscape, epecially the supernatural glow caused by the lingering light. 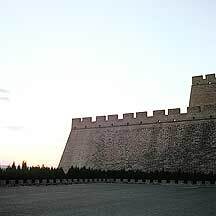 Along its west wall is a narrow path and the Great Wall is attached there as is a reconstructed tower. 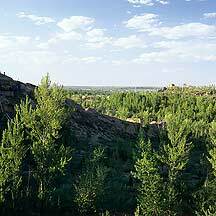 I climbed the Wall to the north side where the ground slopes down. And there, on a levelled part of the slope, I found another group of graves; the gravestones are tall and, I think, black in color. Its getting dark, so I decided to head back to the main road and get back to town. 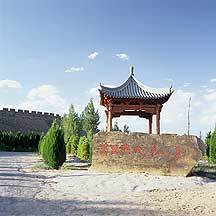 This colossal tower was built on the thirty-fifth year of 万历Wanli (1607) in the 明朝Ming Dynasty (1368 - 1644). 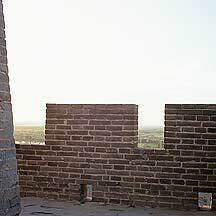 Today, many parts of the tower had been restored and other nearby watchtowers are entirely reconstructed. It may have been use sparingly during the 清朝Qing Dynasty as well, because the shed on the top level collapsed during this time. Twenty years after the establishment of the People's Repulic (1970s), a battalion was here. Since 1992, it has been recognized as an important heritage. 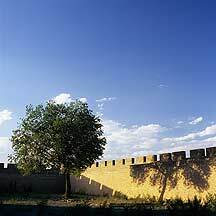 It is one of the most recognizable and greatest points of the Great Wall. In my opinion the 2008 torch bearers ought to climb this magnificent historical beacon tower and light up this desolate area, which is closer to earth and, to me, is more meaningful than the highest point on earth. From 榆林市Yulin city, take the #3 路 lu (road) public bus going north (3). Tell the driver to stop at 镇北台Zhenbeitai Tower (1). It will take about 25 mins. (from near the North Bus Station (6)) to get there. Once you cross the concrete bridge and before a coal-covered dirt road, which takes about a minute later, you will see a paved path to the right. On the left is several residential houses and restaurants. The driver should drop you off here. Up the paved path is the ticket booth - get the ticket here, don't wait til you are at the Tower; you will be directed back down to get the ticket. 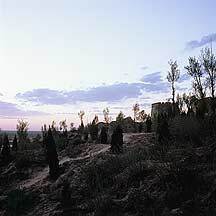 Along the road, on the left, you will see a cluster of gravestones. Continue up and a small pavillion will welcome you. If you are interested in the 红石峡Hongshixia (Red Stone Gorge) (2), get off here as well. There is a road through the houses on the left. A sign on a wall points the direction to the gorge. Just walk the one kilometer there. There were no toilets when I was there in the summer of 2006. But a large one was under construction. By now it should have been completed. Food and drinks are available in the houses by the main road, if you do not want to bring your own.